Thanks to the increasingly fractured way games are released and marketed, it can be difficult to pin down the value of a downloadable add-on pack like Back to Karkand, which introduces a sizeable lump of Battlefield 2 material into Battlefield 3's chassis. For those who preordered or purchased the Limited Edition - perhaps even at the same price as the regular edition - this download is free and so there's literally no reason not to use it. For everyone who has to pay, it's slightly more complicated. For one thing, you'll already have downloaded the content as part of the hefty 2.7GB multiplayer update. It's a presumptuous move on EA's part (and not the first time it's done this for Battlefield) and I wouldn't blame some players for feeling aggrieved at having to take up hard drive space with such an enormous file for content they then have to pay for. Assuming you do want to pay the 1200 Microsoft Points asking price (£11.99/€14.99 on PSN), then what do you get for your money? Gallery: Gulf of Oman has a lot more structures and buildings in its new version, making for more tense cat-and-mouse encounters. Four old (new) maps are the main attraction. Gulf of Oman, Sharqi Peninsula and Wake Island have all been rebuilt to take full advantage of Battlefield 3's visual muscle, but Strike at Karkand, arguably the most popular map in Battlefield's history, is the jewel in the crown. Only Wake Island disappoints, receiving the most radical design changes and a reduction in flag capture points from five to three. Even so, these are some of the best multiplayer maps the first-person shooter genre has ever offered, and with their basic designs retained and enhanced by the Frostbite 2 engine, the combination is thrilling. Fans will feel right at home, with familiar pathways and choke points still in place, but the way the gameworld crumbles and cracks now opens up new avenues that were previously impossible. Classic design meets dynamic gameplay - and the result is as good as you'd hope. Also on offer is one new (old) game mode, Conquest Assault. This mode starts one team with no rally point, but all flags under their control. The attacking team has a home base, and must reclaim all the control points. It's really just a tweak to the standard Conquest ruleset, but one that feels more authentically military in its push-and-hold scenario. Three new vehicles have also made the leap from Battlefield 2, though only specialists will really notice the difference. The F35B fighter is noticeably slower than its Battlefield 3 counterparts and the BTR-90 APC doesn't really offer anything not already available in the current vehicle line-up. Only the DPV Fast Attack Vehicle makes a unique impression: a speedy and manoeuvrable buggy armed with a grenade launcher. The downside is how exposed you are while driving, but it really makes a difference when hitting an enemy hard and fast. Finally, 10 additional weapons join the fray, and each must be unlocked by completing an assignment. So to earn the FAMAS assault rifle, you need to heal and revive ten players. Capturing ten flags, arming ten MCOM stations and playing two hours on Strike at Karkand, meanwhile, opens up the 9mm PP-19 SMG. It's an unusual move that will no doubt annoy those who would prefer to be given the things they've paid for immediately, but it does mean that you're encouraged to play with the maps and new toys in lots of different ways to get the full arsenal. Paid or free, as map packs go, Back to Karkand is hard to fault. The maps themselves are excellent, tried and trusted classics that (Wake Island's diminished scope aside) have been thoughtfully reconstructed for modern FPS play. Conquest Assault is a fine game mode and a welcome addition to the playlist roster, and while the new vehicles and weapons are unlikely to bowl you over with their originality, it's hard to quibble when they're essentially bonus extras. 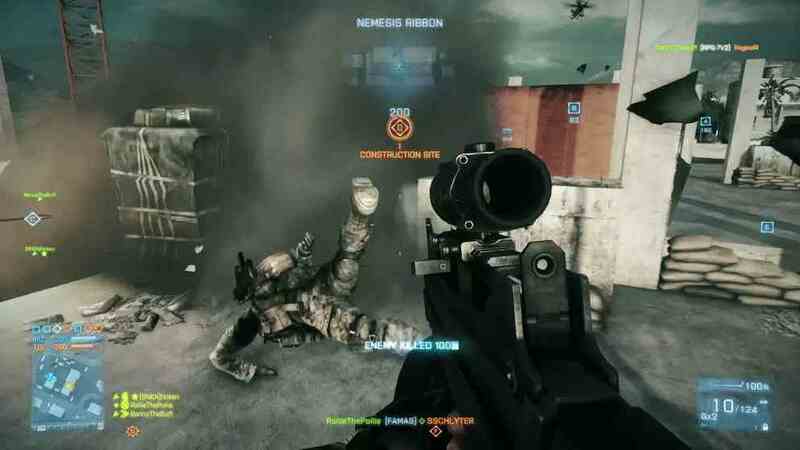 If you play Battlefield 3 online, you'll already have downloaded Back to Karkand. The good news is that it's well worth paying the extra to actually play it.